Geyer’s Towing provides medium-duty & heavy-duty towing services by professionally licensed tow truck operators. Plus, our heavy-duty towing equipment is well maintained and replaced often. Geyer’s Towing aims to reduce vehicle and driver downtime at the same time as minimizing cost to our customers. Geyers caters to independent operators, fleet companies or private owners. Our “wreckmaster” certified team will exceed your towing needs with quality service in a timely manner. We have on-site dispatch for your convenience 24 hours a day, seven days a week. Geyer’s Towing has medium and heavy duty towing equipment to handle any request. Additionally, our fleet is available at all times to provide unparalleled medium and heavy duty towing services. No job is too small or too big for us to handle. Call A Trusted Towing Company. For residents of Maryland, DC & Virginia, you’ll be happy to know that Geyers Towing & Transport is recognized not just by one, but by four police departments in the area. So if you are looking for a local provider of recovery or special towing services, call Geyers Towing & Transport today and know you’re in good hands. Are you looking for a towing company that can provide you with quality heavy duty towing services? Have you ever needed this service, hired a company and then felt disappointed at how they handled the task? If you answered yes to both questions, now is the time for you to be acquainted with Geyers Towing and Transport. Notably, we are known in the entire Maryland area as a great source of different towing and hauling services including Heavy Duty Towing Westminster. Whether you are an individual who needs to transport heavy and overweight vehicles from one place to another or you are involved in a business that deals with transporting heavy equipment, a company like Geyers Towing and Transport is who you should hire. Being in the business since 1993 has given us the experience to deal with different towing situations. Geyers Towing and Transport is the only company you should call in case you need Heavy Duty Towing Westminster services. We provide non-stop, round-the-clock towing services in case you need us at any time of the day. You don’t have to worry that you won’t get the services you need right when you need it. We have a reliable dispatch system which can successfully reach 24 hours a day, seven days a week. You don’t have to settle with the services of just any other towing company in your area. For the best in Baltimore, call Geyers Towing and Transport. We offer Heavy Duty Towing Westminster services along with a whole variety of comprehensive towing and roadside services. We assure you that your vehicle is in good hands by taking care of it as if it is our own. No scratches, no damage, no risk of being stolen or lost. Call us now if you want to know more about our services. 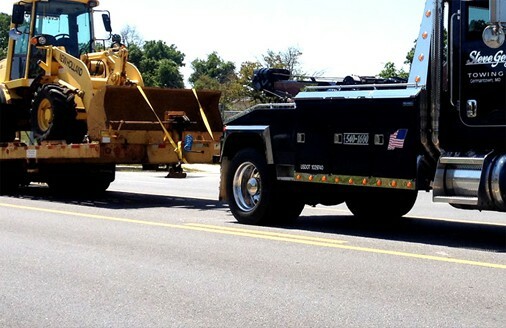 Heavy duty towing Baltimore services are services that cannot be offered by just any towing company. This specific type of towing calls for a special kind of fleet and skills. Here at Geyers Towing and Transport, our staff is knowledgeable with what to do during the actual act of towing. Expect us to treat your vehicle with care and professionalism when you hire for our Heavy Duty Towing Westminster service.